The Battle of Marathon in 490 BC, where an Athenian-led Greek force defeated a Persian invasion, is one of the most decisive battles in Antiquity and has been studied for centuries. It is famed as a triumph of the Greek hoplite heavy infantry phalanx against massively superior Persian numbers. 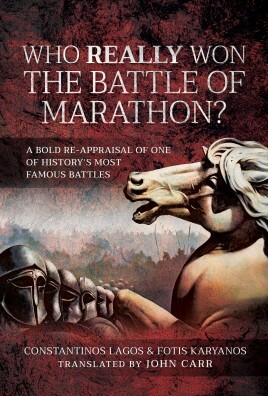 The Battle of Marathon in 490 BC, where an Athenian-led Greek force defeated a Persian invasion, is one of the most decisive battles in Antiquity and has been studied for centuries. It is famed as a triumph of the Greek hoplite heavy infantry phalanx against massively superior Persian numbers. But this exciting re-assessment of the evidence, including new archaeological findings, overturns many long-held assumptions. In particular the authors argue that the Greek numerical inferiority was less marked than previously thought, largely because the hoplites were accompanied by many light infantrymen who are given unprecedented credit for their role in the fighting. The contribution of these poorer citizens, it is argued, led to the immediate strengthening of democracy in Athens. The authors also tackle the much-debated mystery of the whereabouts of the Persian cavalry, generally thought to have been absent on the day of battle. Their bold answer is that it was not only present but played a central role in the fighting. However, the Greeks managed to defeat the Persian cavalry by their ingenious use of the terrain. Karyanos and Lagos also claim to have located the site of the Greek camp. This thoroughly researched and compelling re-assessment is an exciting new take on this justly famous event. Constantinos Lagos holds a BA in History from Athens University and an MA and PhD in Ancient History from Durhan University in the UK. He teaches History in the Hellenic Air Force Academy and the Hellenic Open University. He is the author of a study of the battle of Fort Rupel (6-10 April 1941) and of a biography of Constantine Perrikos, an aviator who fought in the Greek wartime resistance. John Carr has enjoyed a career as a journalist, correspondent and broadcaster (The Times, Wall Street Journal Europe, Vatican Radio), mainly in the Mediterranean and particularly Greece, where he now resides. He is the author of On Spartan Wings: The Royal Hellenic Air Force in World War II; Spartas Kings; The Defence and Fall of Greece 1940-41; RHNS Averof and Fighting Emperors of Byzantium, all published by Pen & Sword.